I don't really like kids, and nor do I like teenagers (I'm 20 now! I can say that!). The result of this is that, usually, when my sims come home from school, I send them straight off to work, tend the crops, look after a baby, or some similarly cruel task: that's great, but what's not great is the fact that, by default, school sends their fun motive so low that it takes the best part of the night to fill it up again before they'll even consider chores. Alright, I know school isn't fun and games, but seriously, EA - it's not that bad! 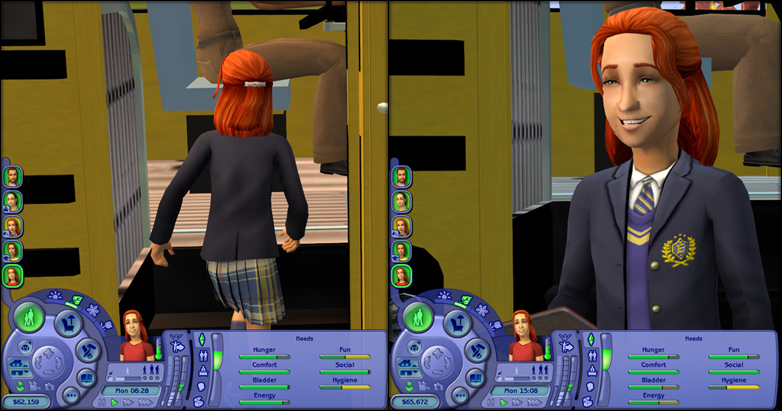 In fact, a sim child going to public school with their fun meter half full will return home with it completely in the red - what, do these children not know how to pass around rude drawings of their teachers in class all day? I'm amazed that no-one has made a mod like this before, but I've searched and searched and I can't find anything: so here it is. Much more manageable, I hope. Compatible with all (or no) EPs, affects both children and teens in both public and private school, install only one version! This replaces the Fun motive delta for both schools. It will, technically, conflict with any default replacement schools; but I would expect minor if any problems. It won't conflict with, or affect in any way, non-replacement schools. 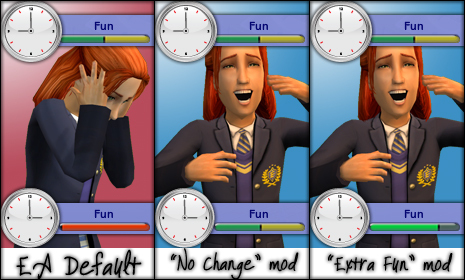 Amongst other things, this means that this mod won't work if you use Inge's schools. Phae, for having her help stare me in the face for half an hour before I noticed it.